Before Fibre Channel appears, SCSI (small computer system interface) was used as the transmission interface between servers and clustered storage devices. But as the high speed demands keep increasing, Fibre Channel replaces SCSI inevitably due to its higher transmission data rate, flexibility, and long distance. This article is going to introduce you some details about Fibre Channel. Fibre Channel, short for FC, is a technology for transmitting data between computer devices at data rate of 1, 2, 4, 8, 16, 128 Gbps. It’s mainly used in storage area networks (SAN) in commercial data centres. It’s useful for connecting computer servers to shared storage devices and for interconnecting storage controllers and drives. Except optical fibre cable, Fibre Channel transceiver is the other vital equipment to connect the Fibre Channel network in data centres. It provides the interface between Fibre Channel systems and the optical fibres of the SAN. FS.COM offers SFPs and SFP+s that are compatible with Fibre Channel. Fiberstore Fibre Channel SFPs support the distance up to 80km and the data rate of 2G/4G. 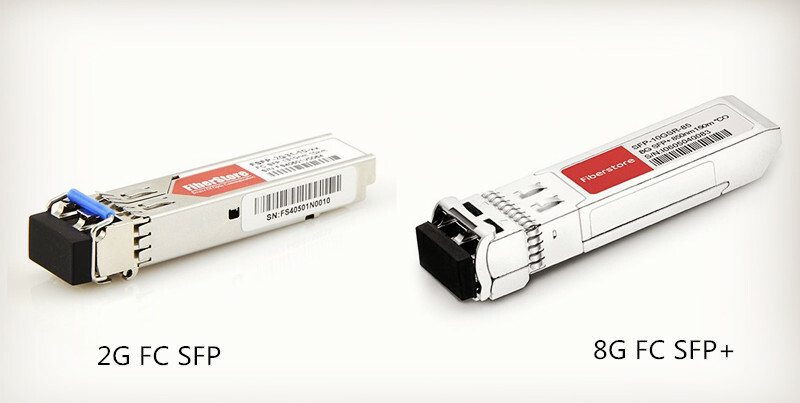 As to our Fibre Channel SFP+ transceivers, they can support the data rate up to 8Gbps and 10Gbps. In Fiberstore, you can also find some compatible brands of FC transceivers including Cisco, Juniper, Brocade, HPE, etc. What’s more, all these modules have been tested to assure 100% compatible. For your information, the following table shows some hot FC transceivers for 2G/4G and 8G/10G network applications. However, as the need for high-bandwidth never stops increasing, the data rate of 2G, 4G or even 8G can’t meet the high speed requirements. So many data centres move to higher Fibre Channel standards, for example, 16G Fibre Channel. 16G FC links increase the network speed twice as 8G FC and 40% faster than 10G FC. The transition to 16G FC makes data transfer smoother, quicker and cost-effective from the good side. But from the other side, the transition still faces some challenges. There might be some data communication error rates that may affect the network performance. And the physics of 16G FC can possibly bring some new restrictions on fibre cabling and transceiver modules. Therefore, before starting to transfer to higher speed Fibre Channel infrastructure, you should better follow the tips listed below. First, cleaning issue. In fibre optics connection, contamination is thought as a big problem which may lead to link failure. So you should clean all the transceiver modules, connectors and other cable junctions to ensure there is no contamination in the fibre optic connection. Some fibre testers and cleaning tools are necessary for your cleaning work. Second, analyze the optical power budget between transmit and receiver ports. It requires that the power margin (transmit power minus power loss during the data transmission through the cable) should be more than the receiver power of the optical transceivers. At the same time, it also should meet the FC protocol specification. Third, measure the light level on the transmitting side and receiving side. You can use suitable fibre optical light source or optical power meter to measure the power level on critical links. If the power level were not in the right station, check whether the cable length is suitable or cable bend radius reaches the maximum. Then you are suggested to purchase customized bend insensitive fibre cable for your special use. Fibre Channel is commonly used for the connection of SAN in enterprise storage. You can find 2G/4G FC SFPs, 8G/10G FC SFP+ modules and matching fibre patch leads from FS.COM. If you need to upgrade your Fibre Channel network to 16G or even higher, remember the above tips and make sure the 16G FC are compatible with 4G FC and 8G FC. This entry was posted in Fiber Optic Transceivers and tagged Fibre Channel, Fibre Channel SFP, SAN on December 20, 2016 by laura.